US equity indexes closed broadly lower, sp -22pts at 2409. The two leaders - Trans/R2K, settled lower by -0.7% and -1.3% respectively. 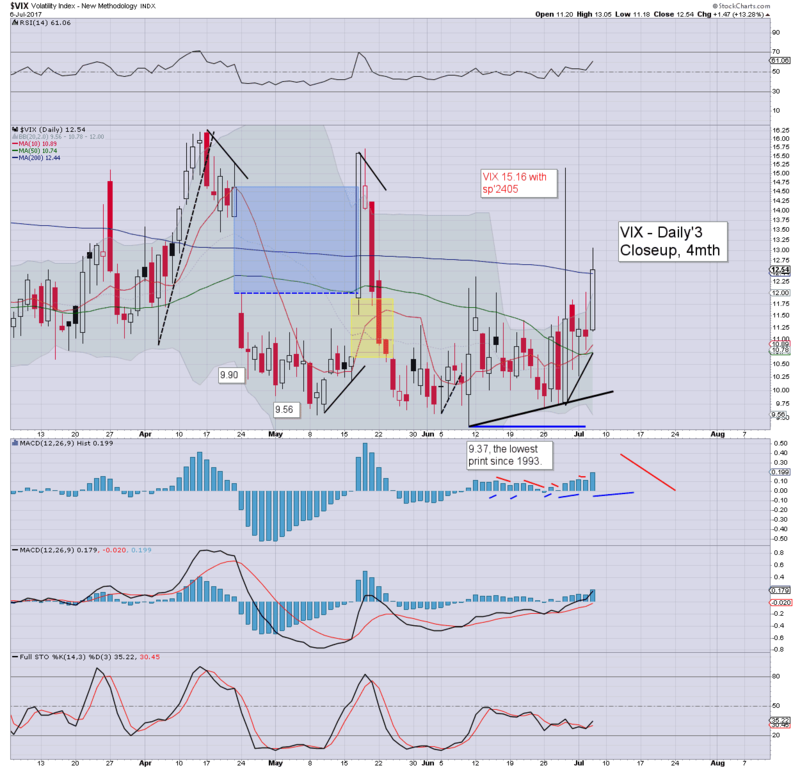 VIX settled +13.3% at 12.54. 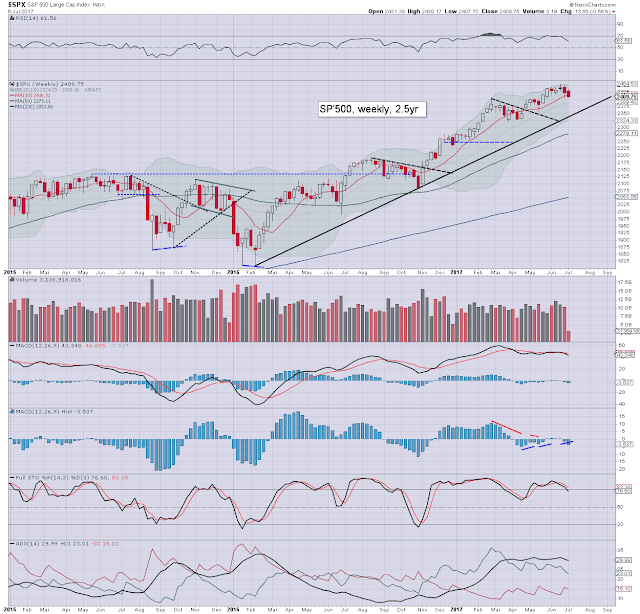 Near term outlook offers a break under the sp'2400 threshold, with a subsequent washout around 2352/48. 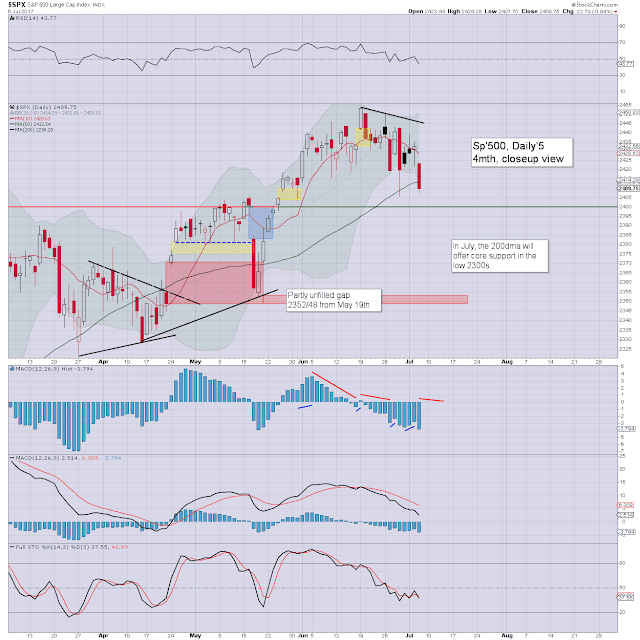 US equities opened moderately weak, and despite some sporadic minor attempts to recover, the bears managed to restrain things. The closing hour was distinctly weak.. and that has been the case a fair few times recently. The daily close under the 50dma is pretty bearish. Even if tomorrow opens higher on 'goldilocks' jobs data, the market will still be inclined for another rollover into the weekend. Market volatility is picking up (intra high 13.05), with the VIX managing a daily close in the mid 12s. Note the black-fail candle from two weeks ago, those are very rare on the weekly/monthly cycles. We've seen that candle confirmed, with what is set to be a second consecutive net weekly decline. Rising trend - that stretches back to Feb'2016, will offer powerful support around 2350 next week.